After testing the build, I've changed a few things for the base skill set. The build can practically run a normal group dungeon solo. Swapped front bar to back bar and visa-versa. Long buffs and AoEs on front bar, direct attacks and short framed buffs on back bar. Keep your short buffs (Shimmering Shield and Deceptive Predator) always up. Timing and rythym. The combination of Heroic Slash and Shimmering Shield (it works against arrows too and gets pinged constantly in group dungeons, well worth it) are purposefully placed to get your extremely devastating ultimate, Permafrost, up as soon as possible. The Enchanted Forest ultimate is there for emergency use but also gives ult back to help get it up again. Super balanced! Overland solo, dungeon tank, pvp survivability and kills. Take time to review passives. You get major boosts to your health and damage mitigation from both Warden and Nord passives and abilities. Use at least one weapon damage and one spell damage glyph on your jewelry. Destructive staff passives allow you to use the ice staff to taunt at range with a heavy attack and also allows you to block with magicka if your stamina is low, but with Bull Netch and the provisions you should be good on stam. I'd suggest reduce cost of spells enchantment for the amulet. The Lady or The Steed boon depending on your situation. 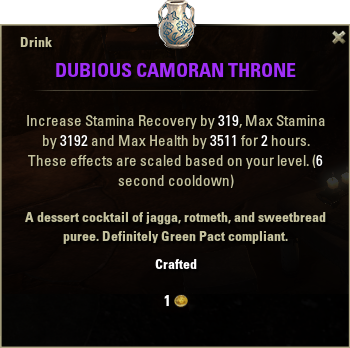 Run at least 5 divines traits, 2 impen, one sturdy on shield. This build is best played as a vanguard when taking keeps and close quarter combat. Since there isn't any gap closer, open field skirmshes could get boring. I chose Power Slam instead of Reverb for the extra damage and swap out Arctic Blast with Corrupting Pollen for the enemy healing debuff. It has a wide area and distance, hard for enemy players to get away from. Try to focus on closed in enemies within structures to drop your AoEs. Stay with a group. As the Vanguard you have to be the first to rush in, but make sure they've got your back. Play around with it, substitute in Frozen Device for gags in PvP. 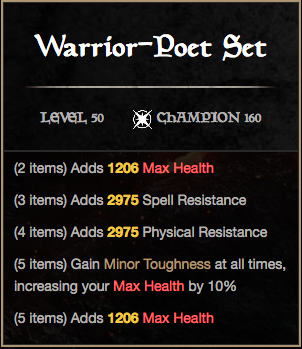 Also, look further into the Warden class passives, such as Flourish, to understand the balance of this build! Good stuff! 75 points into Shadow Ward. All other points destributed evenly across damage mitigation and output (consider frost damage). Hey Matt, yes I leveled this build up from 1 when I first conceived it. However you obviously won’t have all the skills unlocked at first. You will need to use at least two other animal companions abilities on each bar initially to level up that skill tree quick enough to get the Netch and Predator skills unlocked sooner than later. Use fungal growth until you have healing seed. Focus on leveling up sword and shield first then destro staff once you have your second bar unlocked. Use training gear and do lots of random group dungeons in the activity finder. It gives you loads of content. A more efficient and fun way to grind. You won’t have any trouble being matched up as a tank. You have to choose random though for the bonus xp. 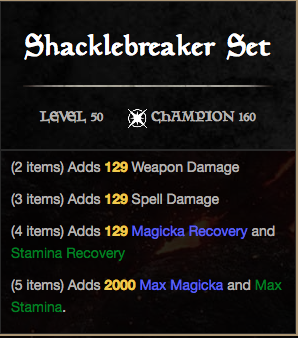 If you don’t have enough traits unlocked yet to craft shacklebreaker, either find a friend who can or use drops from the dungeons until you do. Warrior poet is pretty easy to find in Vvardenfell. Thank you so much. Having fun with this but have adapted it to duel weild. Only going for steel tornado instead of elemental blockade. Is this build good for raids? what traits on armour sets? Just starting with this build. Any chance you could tell me how to spend my points at the start? I had a lot of fun with this build. It’s kind of hard to know what to make of it at first but I leveled it up and outfitted it almost exactly the way it was described with all the abilities and cp160 gear and it turned into a really great tank. It’s a lot of fun for veteran dungeon runs and works really well for any single player missions as well.